Paris is always a good idea but can be expensive for most travelers, but there are ways to make your money go further. Discover the Paris of locals, authentic and real, gorgeous as always but not expensive. It’s all too easy to keep to the tourist destinations but look a little further and you’ll find the real Paris at a fraction of the price. If you like sketching, photographing or sometimes just need an art museum fix then Paris is the perfect place to enjoy all three. 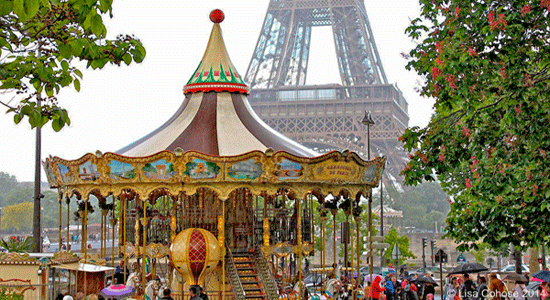 With a little pre-planning, Paris can be enjoyed without spending the children’s inheritance. One place that is a bit off the beaten-path but well worth the effort is between Monceau and Batignolles in the 17th arrondissement. 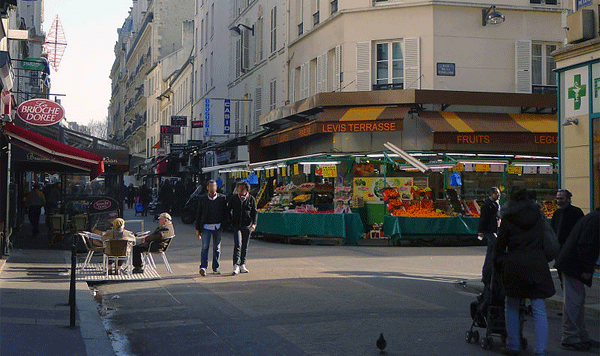 My favorite stop is always Rue de Lévis, a historical pedestrian street market, clearly off the tourist route. Here you can fill your shopping bags with bread, cheese and wine and where the smell of rotisserie chickens wafts through the air – one-stop shopping. You can find everything foodie here from delicatessens to grocery stores as well as some fun boutiques. You can eat well by shopping at local market, a feast for the eyes and for the artists at heart. It costs nothing to sketch or photograph a colorful and fun street scene with beautiful vendor carts and stalls. 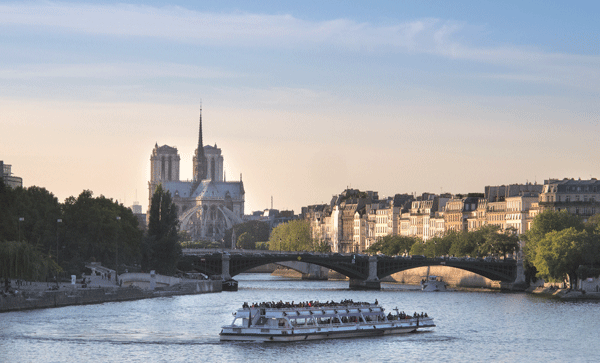 Use the budget friendly Batobus water taxi- shuttle service on the Seine, around 20 euros for a two-day pass, with nine scheduled stops – all close to Paris’ main districts and monuments. You can hop on-and-off, all day long, sketching and photographing until your heart and sketchpads are full. Some of the most magnificent photo-ops are at night when all the monuments are illuminated or when the Eiffel Tower begins to twinkle. What better way to finish off a wonderful day in Paris than with night photography. 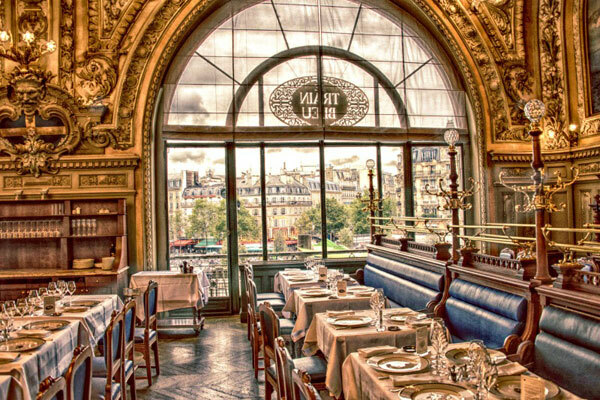 Lastly, take a refined break in the regal Le Train Bleu Restaurant hiding inside the Paris-Gare de Lyon train station, in the 12th arrondissement. It is the most unexpected location to find original art and a wonderful ambiance – setting the stage from the 1900’s. The restaurant depicts European landscapes in frescoes and paintings by the most prominent artists of the 19th century: François Flameng, Henri Gervex, and Gaston Casimir Saint-Pierre. All can be enjoyed for the price of an Espresso or Cappuccino in the Le Train Bleu Bar – it’s the perfect end to a perfect day in Paris, with ambiance and art in a graceful and refined setting. Credits: J.Christina is the blogger behind www.scribblesandsmiles.net. 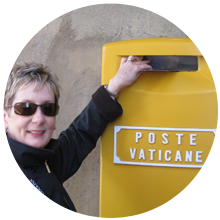 Blogging from the Midwest, J. Christina, and her husband, Mr. Christie, share their European trips so others can travel vicariously through their travel scribbles and images.